Students of the Indian Institute of Management, Calcutta (IIM-C), normally given to casual wear, roamed the college lawns in blazers on a warm afternoon recently. A large flex board nearby explained why. "Summer Placement 2016", it proclaimed. Below the announcement ran the bullet points from the 2016 Financial Times Masters in Management rankings: IIM-C was best globally in terms of careers, a category that reflected how graduates of 2013 had fared in the real world over a three-year period till now. It was third in Asia and 23rd worldwide in overall B-school rankings. The proverbial cherry on the top, ironically, was the legend that ran right at the bottom: "India's first Triple Crown business school". The flex board was more than an announcement of the placement programme; it was a statement on IIM-C's place in the sun. The "triple crown", for instance, refers to accreditations awarded by the Florida-based Association to Advance Collegiate Schools of Business, the London-based Association of MBAs and the Brussels-based European Quality Improvement System. Of the near-14,000 B-schools that offer business degree courses worldwide, only 76 wear the "triple crown", of which only seven are Asian. "Others in India hold one or two crowns, only we hold all three," says Uttam Kumar Sarkar, Dean, New Initiatives and External Relations. "That sets us apart." IIM-C in 2012 also became a member of the Global Alliance in Management Education or CEMS, the acronym derived from the entity's former name, the Community of European Management Schools and International Companies. CEMS involves some 30 leading B-schools and over 70 MNCs and NGOs globally; the membership has helped IIM-C become the first Indian B-school to offer the Masters in Management degree, rated among the top management degrees worldwide. This September, IIM-C also hosted the prestigious CEMS student board meeting, the next being scheduled in Stockholm. Beyond the focus of the regular CEMS initiatives, the event also provided IIM-C with an opportunity to enlarge its footprint in the alliance and promote it in India. "A member-institute generally has to wait 30 years to get its turn, we got it within three years of becoming a member," says Sarkar, who believes its selection so soon reflected IIM-C's positive image abroad. It is also a measure of the success of its "internationalisation" drive, a key focus area for it, and is an endorsement of the triple accreditations that are awarded only after a rigorous peer review. Students are taught three foreign languages - Spanish, German and French - to prepare them for jobs abroad. The strength of visiting faculty has swelled, and "is very high", while IIM-C has around 100 students on international internships. The tie-ups teach global practices. The CEMS initiative, for instance, is a "second round of skilling" for the 19 students who had to qualify for the programme. Plus, hosting the student board meeting connected IIM-C's students, faculty and corporate partners with foreign delegates. Visitors assessed the students, the learning environment and the academic quality, while IIM-C's research centre got to collaborate with them. "It added to our brand value," says Sarkar. A recent innovation is business analytics. From June 2015, the institute has begun offering a two-year post-graduate diploma course in business analytics, split into four semesters of six months each. Students spend the first semester at the Indian Statistical Institute honing their knowledge in Mathematics; the following is spent at the Indian Institute of Technology-Kharagpur; the third semester at IIM-C, and the final six months with the corporate sector. Sarkar is upbeat about the initiative. "There is a huge demand for people skilled in Maths, Technology and Management," he says. Students enrolled for the post-graduate diploma for executives are required to undertake an all-paid "International Immersion" programme, offered in collaboration with a Japanese agency. The last batch visited Michael G. Foster School of Business, US and the Mannheim Business School, Germany. "We are very clear on what we want to be," says Sarkar. 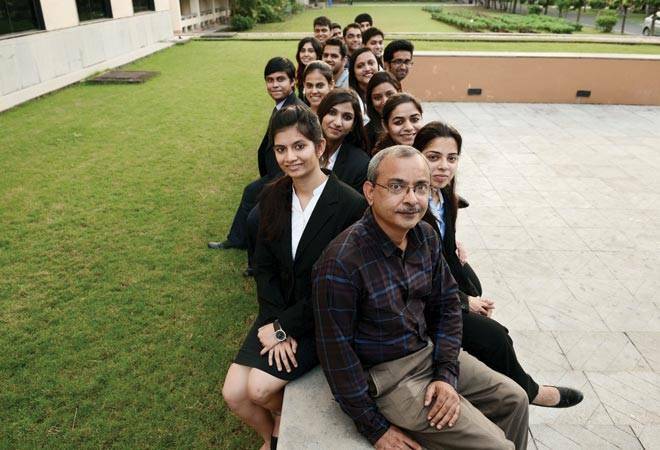 "The top B-school in India and, hopefully, one of the very best in the world." "Recession is the easiest time to hire talent"